Democratic superdelegates are shaking in their boots, and rightly so. The vast majority of these unpledged delegates, who will cast their votes at the Democratic National Convention in late July, quickly lined up behind former Secretary of State Hillary Clinton as soon as she announced her candidacy. At the time, one year ago, Clinton certainly seemed like a lock for the Democratic presidential nomination: She was Democratic Party royalty, an experienced campaigner, and had a gold-plated Rolodex of who’s who in Washington. As a woman, she was identity politics gold. As a political centrist, she was expected to immediately attract a critical mass of moderate and independent voters. With everything Clinton seemed to have going for her last spring, why wouldn’t superdelegates rush to pledge fealty? With the Republican nominee likely to be former Florida governor Jeb Bush, the younger brother of unpopular former president George W., it seemed likely that Clinton would win handily in November as well. Democratic superdelegates who curried favor early on would be atop shortlists for cabinet posts and other positions within the inevitable Clinton administration. In late May 2015, backing Hillary Clinton was a no-brainer for Democratic superdelegates who cared more about perks and positions than principles. But then the e-mail server scandal blew up, Clinton proved little better on the stump than in 2008, she botched the whole Goldman Sachs speech transcript thing, and so much more. Undoubtedly, many Democratic superdelegates are angry and anxious, feeling that they got caught in a bait-and-switch. 2016 was supposed to be an easy Clinton victory, both in the primary and in the general, and she couldn’t. Stop. Botching. It. Despite everyone in the establishment pulling for her, giving her unimaginable advantages, the former First Lady just couldn’t close. Hillary Clinton enjoys the loyalty of the mainstream media. She enjoys the fealty of the Democratic Party establishment. Her supporters control the state parties and can engage in all sorts of machinations to provide her with extra delegates here and there. And yet, despite all this unethical aid, Clinton still can’t get it done. She is losing in national polls to Republican nominee Donald Trump, has record-high disapproval ratings, and cannot spark even a fraction of the energy and zeal whipped up by challenger Bernie Sanders. 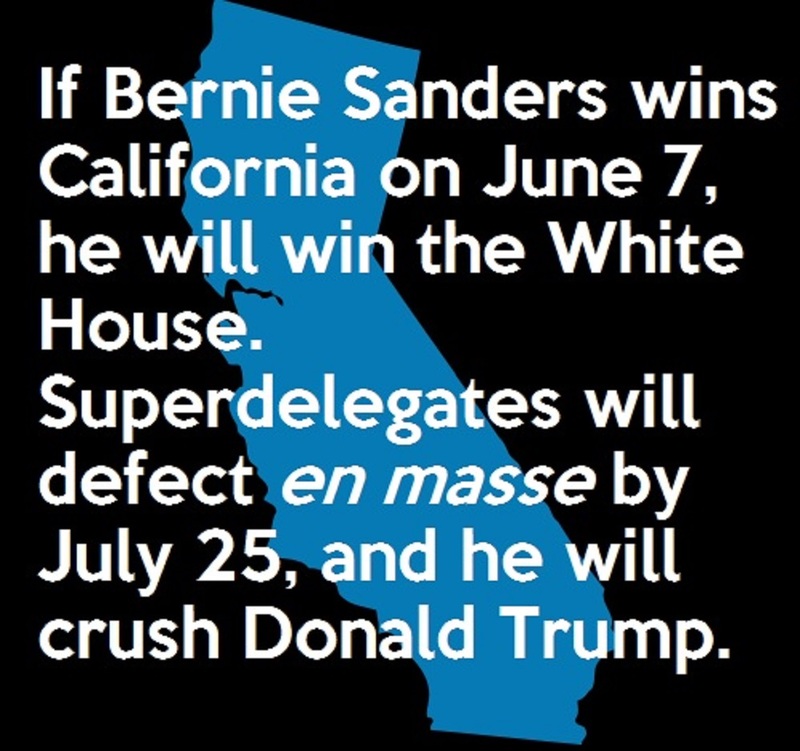 If Hillary Clinton loses California on June 7, her superdelegates will begin to defect en masse to prevent nominating a flawed candidate who will lose in November. Though the mainstream media has yet to seriously discuss this possibility, I feel certain that it is an inevitability. When Bernie Sanders wins California, Clinton’s mass of unpledged superdelegates will begin to seriously doubt her ability to win in November. They will no longer to be able to ignore the myriad of polls which indicate that Bernie Sanders runs far better against Donald Trump than does Hillary Clinton. Between June 8 and July 25, the beginning of the convention in Philadelphia, most superdelegates currently allied with the former First Lady will begin looking for a graceful defection if Sanders wins California. Even if the former U.S. Senator (D-NY) “clinches” the nomination on June 7 by winning enough pledged delegates to bring her pledged delegate + unpledged superdelegate count to the required 2,383, the mass defection will still occur if she loses California. The loss in California will unequivocally signal that Hillary Clinton does not enjoy the will of left-leaning voters and has lost her mojo. Though many pundits will initially congratulate Clinton for surpassing 2,383 delegates, exit strategies will soon be implemented by superdelegates, commentators, and pundits alike. Not wanting to be blamed for nominating a flawed candidate whose aura is tainted by perpetual scandal, superdelegates will reference a number of factors: The State Department report, the ongoing FBI investigation, the civil lawsuit filed by Judicial Watch, the failure to release the Goldman Sachs transcripts, the weakness in polling against Donald Trump. Once Bernie Sanders wins California, the myriad of reasons for superdelegates to vote against Hillary Clinton become writ large. They will become unavoidable, deafening. In June 2015, Hillary Clinton was the safe choice for superdelegates. In June 2016, she will become the toxic choice for superdelegates. U.S. Senator Bernie Sanders (I-VT) will become the new safe choice, enjoying a 10+ point polling advantage over Republican nominee Donald Trump and guaranteeing that the vast majority of liberal Millenials actually vote on election day in November. Throughout the primaries, Sanders has revealed time and again that he delivers crucial swing voters and swing states, both of which the Democrats need to win the electoral college. Hillary Clinton may have demonstrated strong staying power with registered Democrats, older liberals, and African-Americans, but these voters, quite frankly, were already guaranteed to vote for any Democratic nominee. Only Bernie Sanders brings in fresh blood, new talent. When he wins California, superdelegates will no longer be able to deny that he is necessary to bring in independents, Millenials, progressives, and white men on election day. If he wins big in California, he will also demonstrate that he is crucial in delivering the Latino vote in November. 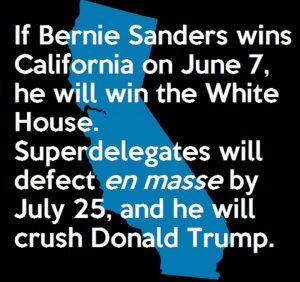 We Berners, therefore, must do everything in our power to deliver a big win for Bernie Sanders in Cali on June 7. If he wins there, he wins the White House. Don’t forget to “like” The Bern Report on Facebook.